RIVIERA MAYA, Mexico - The 10th annual Riviera Maya Jazz Music Festival will feature a one-of-a-kind lineup of some of today's greatest jazz performers. 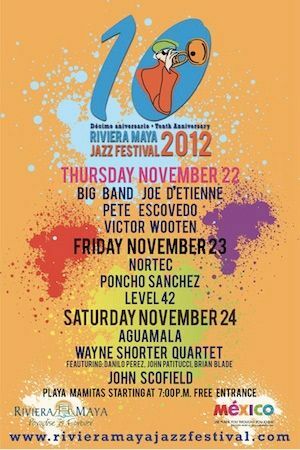 Nestled between the white sand beaches and verdant jungles along the Eastern Caribbean coast of Mexico's Quintana Roo, Riviera Maya will vibrate to the rhythm of Jazz for 3 days on November 22nd 2012 through November 24th. The festival, hosted in Playa Mamitas and considered to be among the top 10 jazz music festivals in the world will allow music lovers to enjoy stellar performances by world-renowned artists. Over the past 10 years the festival has hosted big names such as George Duke, Four Play, Sergio Mendes, Herbie Hancock, Ivan Lins, Armando Manzanero, Sacbe, Stanley Clarke and Yellowjackets. "The tenth annual Riviera Maya Jazz Festival will showcase jazz at its finest," said Dario Flota Ocampo, general director of the Riviera Maya Destination Marketing Office. "Every year we continue to improve the festival and we are pleased to provide travelers the opportunity to enjoy the performance of world-class jazz artists at one of the world's top travel destinations." Joe d'Etienne and his Big Band: The trumpet player, composer, arranger and pianist will kick off the festival. John Scofield: Tee masterful jazz improviser whose music falls somewhere between post-bop, funk edged jazz, and R & B will close the festival. The 10th annual Riviera Maya Jazz Festival will be a celebration of music, history and culture in a beautiful venue that will provide sea, sand and sunsets, adding to the magic and beauty of the event.